Identity/Class: Human mutated by magic. Powers/Abilities: Able to fly. Able to generate electricty and "lightning heat". Some level of invulnerability (he is able to contain a grenade detonation in his hand without apparent injury). Superhuman strength (strong enough to throw a plane). Can move at superhuman speeds. Able to keep track of his fellow hero, Lightning Girl, through their shared "lightning impulses". Can recharge himself by absorbing electricity. History: "Robert Morgan, young American, has been schooled in all the ancient and modern sciences. Given great powers by the Old Man of the Pyramids, he is named Flash Lightning, and sent out to fight for the right at all times, against all odds..."
(Sure-Fire Comics #1) While exploring a pyramid, Robert Morgan encountered the mystical Old Man of the Pyramids, who granted him immense powers so long as he promised to use them to fight evil. Morgan, now calling himself Flash Lightning, returned to the U.S. to battle an enemy army hidden within his country. (Sure-Fire Comics #2) Flash dropped his civilian identity completely, and changed his hero name to Lash Lightning. The Old Man left for parts unknown. 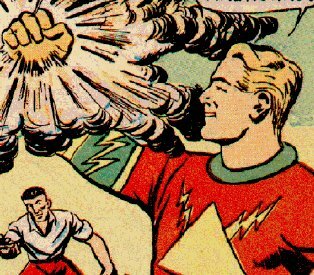 (Sure-Fire Comics #3, #3 (again); Lightning Comics Vol.1 #4 - Vol.2. #4) No synopses available. (Lightning Comics Vol.3 #1) Lash unitentionally gave powers to his friend, Isabel Blake, who became his partner, Lightning Girl. (Four Favorites #1-22) No synopses available. Comments: Probably created by Bob Turner. Many of his early adventures were drawn by Jim Mooney. He was renamed "Lash" from his second appearance to avoid confusion with D.C.'s superspeedster, the Flash. Midway through his run in Four Favorites he dropped the Lash as well, and was simply known as "Lightning". Lightning Comics was the new name for Sure-Fire Comics, changed to take advantage of the popularity of it's star - hence Vol. 1 #4 was it's first issue with the new name. Thanks to Joe Bromhead for providing additional information about this character. Powers/Abilities: Able to fly. Able to generate electricty and "lightning heat". Some level of invulnerability. Superhuman strength. Can move at superhuman speeds. Able to keep track of her fellow hero, Lash Lightning, through their shared "lightning impulses". Can recharge herself by absorbing electricity. History: (Lightning Comics Vol.3 #1) When a nearly unconscious Lash Lightning accidentally sends thousands of volts of electricity through his friend and ally Isobel Blake, she gains electrical powers just like him. 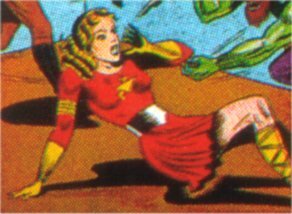 Adopting a similar costume (albeit with a mini-skirt), she becomes his partner, Lightning Girl. (Four Favorites #6-22) No synopses available. Comments: First image of Lightning Girl comes from Steve Rogers' Golden Age Comic Book Library. Used with permission.